Kos, one of Greece's Dodecanese islands is soaked in history and is known for its coastline that stretches for nearly 300 kilometres. There's something for everyone from ancient ruins to cosmopolitan cafes. Visit the ruins of this renowned ancient medical centre located on an olive grove-clad hill 4km to the south east of Kos Town. Built to honour of the god of health and medicine, Asklepios it dates back to the 3rd century B.C. The castle was built by the Knights of Templar in the 14th century as a defence against the Ottomans, you enter via the 16th century gateway before being able to walk around the remains of its inner walls. 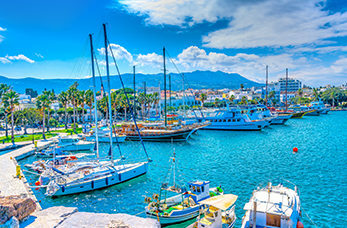 Kos has over 290 kilometres of coastline and an ample amount of beaches, that come in all shapes and sizes from hidden coves to long sandy stretches lined with bars and restaurants. The island of Nisyros is composed of volcanic rock formations. This huge volcanic crater was formed by a massive eruption in the 15th century, it's a scenic gem and definitely a must see whilst you're in Kos.